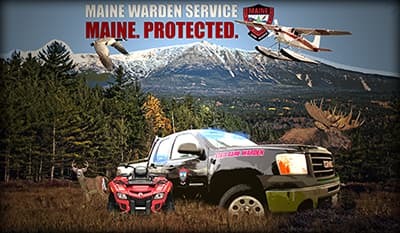 The Maine Warden Service was established in 1880. Today, nearly 140 years later, the men and women who proudly wear the red coat as Maine Game Wardens remain as committed as ever to the citizens, visitors, and natural resources of the great State of Maine. including laws and rules pertaining to inland fishery and wildlife resource management and protection, registration and operation of snowmobiles, watercraft, and all-terrain vehicles, and general laws. including coordination and implementation of all operations as specified under section 10105, subsection 4.
as needed for management and protection of inland fisheries and wildlife resources. As game wardens work to protect our precious natural resources, we rely on the public to be an extra set of eyes and ears. If you witness a violation or suspect illegal activity, please report! An estimated $2.4 billion of our state's economy can be attributed to sporting, outdoor recreation, and ecotourism, with hundreds of thousands of people venturing into Maine's woodlands and inland waterways each year. It's our duty to help everyone stay safe in the outdoors, while also protecting the diversity and availability of our fish and wildlife resources. Over the years, our job has expanded to involve not just law enforcement, but also search and rescue practices, education, and community involvement. To be effective, we rely heavily on the cooperation, assistance, and support of all who enjoy the Maine outdoors. We are here to educate and assist people in their compliance with conservation laws, and to enforce those laws when individuals choose not to comply. We have no tolerance for willful acts of poaching. Poachers steal from all who enjoy our unique and vast natural resources. Maine Game Wardens are progressive, highly motivated, faithful to our heritage, and adaptive to change. We're also aware of the tremendous responsibility we have. If you are interested in an outdoor law enforcement career and up to the challenge of this profession, please contact your local Game Warden and take the time to visit the Game Warden Careers section of this site.